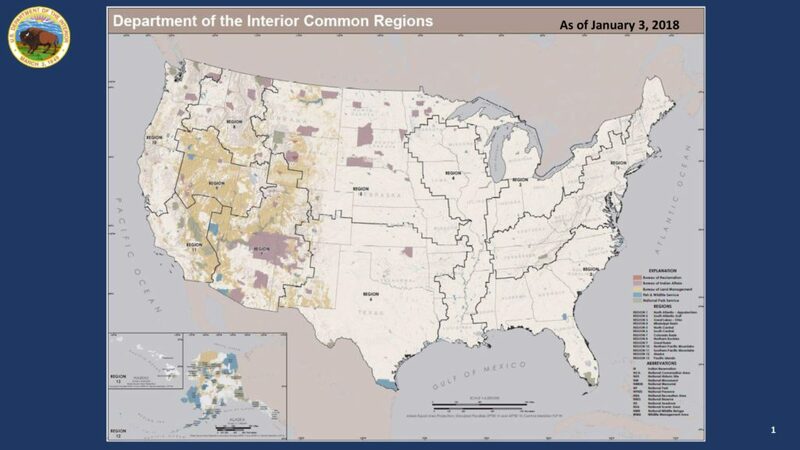 Reorganization plans within the U.S. Department of the Interior call for the creation of 13 regions not limited by state boundaries. Like many states, Iowa is divided — eastern and central portions of the Hawkeye State grouped with lands along the Mississippi River, and western Iowa aligned with Nebraska, the Dakotas and pieces of other states. Gritty details aren’t expected until the Trump administration presents its budget sometime next month, but a preliminary map of the proposed regions shows much of Iowa grouped with lands that stretch from nearly the Canadian border to the Gulf of Mexico, a region labeled as the “Mississippi Basin.” A western portion of Iowa joins with various allotments of nine other states to form the “North Central” region. To say the switch is unprecedented is an understatement. It’s the largest reorganization in the department’s history, shifting thousands of workers to new locations and eliminating positions, and changing the way the government manages millions of acres of land and water. The sheer area of the proposed Mississippi Basin region, with its often opposing views on land and water management, make that headquarter placement a complex proposition. Would agencies’ views and policies regarding the connection between the dead zone in the Gulf and Midwestern agricultural be swayed by geographic proximity? What changes if proposals to move the National Oceanic and Atmospheric Administration and the U.S. Forest Service under the umbrella of the Interior are approved? More to the point, how much actual policy power would the regions have? Also not yet known is how the reorganization would impact localized programs within the U.S. Geological Survey like the Iowa Water Science Center. The Trump administration’s 2018 budget proposal includes cuts that would reduce research at the nation’s 32 water science centers. As the process moves forward, most will focus on the massive impact to western states, but Iowans would be foolish to think that shifts of this magnitude won’t affect this state’s resources. This column by Lynda Waddington originally published in The Gazette on Jan. 20, 2018.